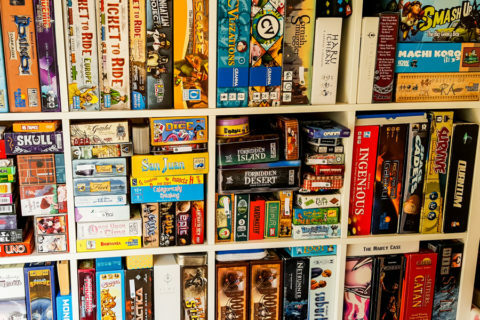 I’m Jamey Stegmaier, the lead designer and co-founder of Stonemaier Games. I’ve designed several games—Viticulture, Euphoria, and Scythe—as well as an expansion pack for Viticulture called Tuscany. This story is about another expansion, Invaders from Afar, which expands Scythe. 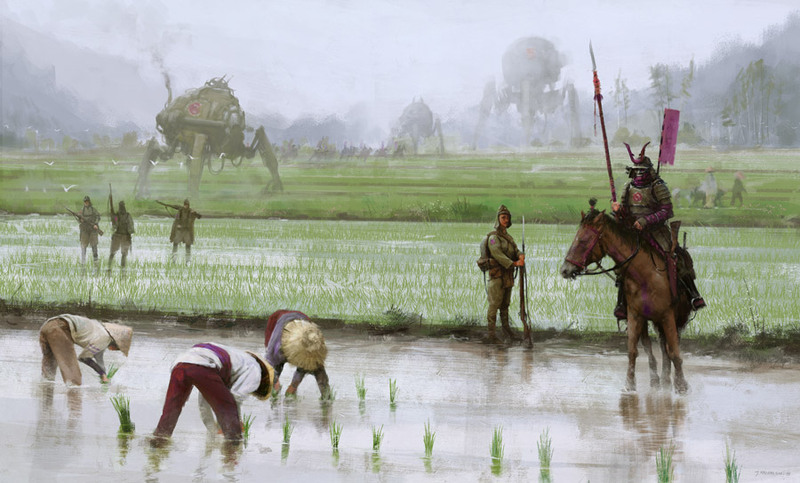 I started working on Scythe in the summer of 2014 when I partnered with artist and world builder Jakub Rozalski. 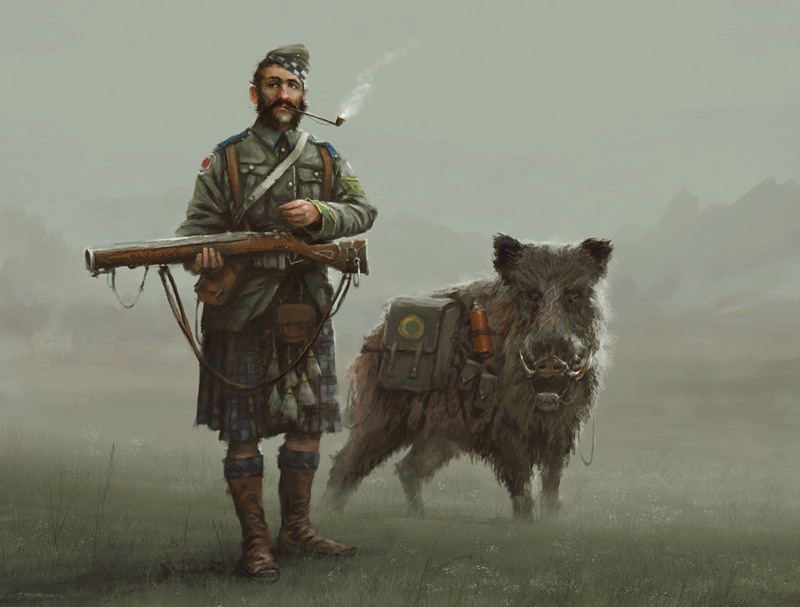 Jakub had been developing the world of Scythe as part of his alternate-history 1920s series, which focused on a war between Poland and Russia. 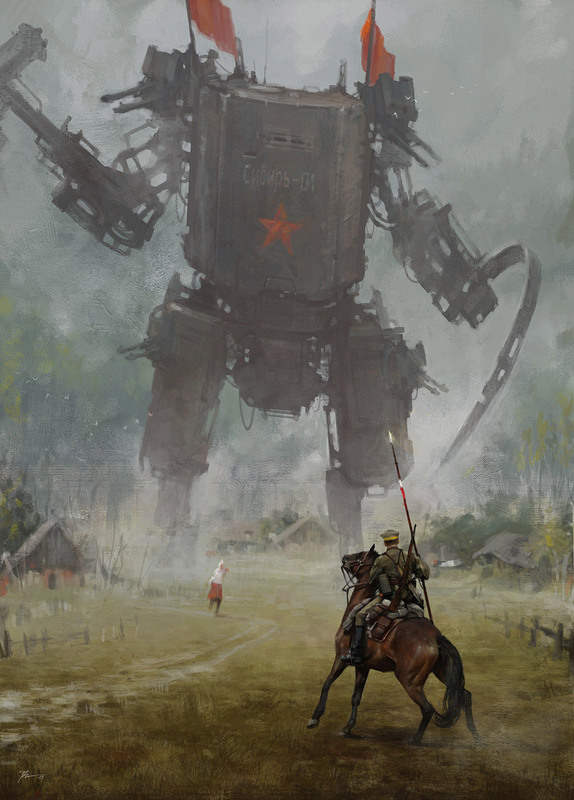 Art by Jakub Rozalski. Used with permission. One of the first things I asked Jakub was if he would be open to including other countries/factions in the story, as I wanted to design a game for more than just 2 players. Jakub agreed to the idea, saying that he already had some ideas for other factions. We decided (somewhat arbitrarily, as I recall), that the core game would have 5 factions, thus allowing up to 5 players to play Scythe. That turned out to be a good number for the playing time I was targeting (90-120 minutes) and the price of the game ($80, which is directly proportional to the manufacturing cost). But I mentioned to Jakub fairly early on that I wanted to leave some design space open to adding new factions in the future, particularly factions that felt distinctly different than the original 5 factions. Jakub seemed excited by that idea, even sending me an early version of this image in December 2014 while Scythe design was still very much in flux. The design for the Scythe game board took a long time, but when it was close to its final form in the spring of 2015, I picked two spaces on opposite sides of the board and asked Jakub to add the expansion faction emblems as their home bases. This was somewhat of a debate, because we didn’t want to confuse customers into thinking they were getting a game with 7 factions instead of 5, but we also felt it would be more organic to include the home bases on the board instead of having players add them later in the form of cardboard disks. The second half of 2015 was spent blind playtesting Scythe, planning for the Kickstarter campaign, running the Kickstarter campaign, cleaning up after the Kickstarter campaign, and preparing the digital proofs to send to our manufacturer, Panda. It wasn’t until January 2016 that I really sat down to figure out what these expansion factions were all about. This is, of course, a backwards way to design an expansion: The expansion faction home bases were already on the game board as if they were already created, but aside from a few pieces of teaser art, the factions themselves weren’t designed at all. The first thing I did was talk to Jakub and brainstorm the theme, motivations, and quirks of the Togawa and Albion factions. We came up with the Japanese concept of the ronin—a lone samurai—and a mischievous monkey seemed like a good fit for the Togawa character. 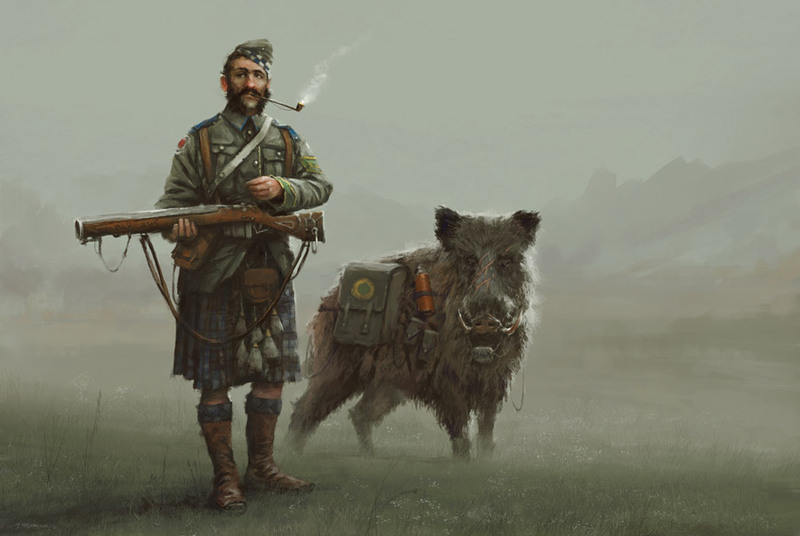 For the Albion faction, which has its roots in Scotland, we wanted to instill a sense of steadfast patriotism paired with combat experience. It was around this time that I pulled Morten Monrad Pedersen and David Studley (from Automa Factory, which designs solo variants of our games) to see if they had any thoughts about the first versions of the mech and faction abilities I had created. They both gave me the same feedback: Most of the abilities seemed interesting, but the expansion factions were lacking a level of uniqueness that would distinguish them from the original factions. That’s why I devised the Flags and Traps. These are tokens that the Albion character (Flags) and the Togawa character (Traps) can place on a territory after they move. During the game, Flags (when paired with the mech ability Rally) can be used to help an Albion character or mech jump across the board, and at the end of the game, if a Flag token is under Albion control (and if it isn’t next to their home base, as they want to conquer new land), that territory is worth +1 territory for end-game scoring. As for Traps, the Togawa player places them face-down on the board as their character moves around, and when an opponent’s unit moves onto the Trap territory, the Trap springs, causing that player to either lose popularity, combat cards, power, or coins (each token is different). At the end of the game, each armed Trap gives the Togawa control of its territory. Togawa also has a mech ability (Suiton—Togawa’s abilities are all Japanese words) that lets it move onto lakes, as I thought there needed to be another faction to interact with Polania and Nordic on lakes. And Albion has 2 non-movement mech abilities (Sword and Shield), which is different than other factions. 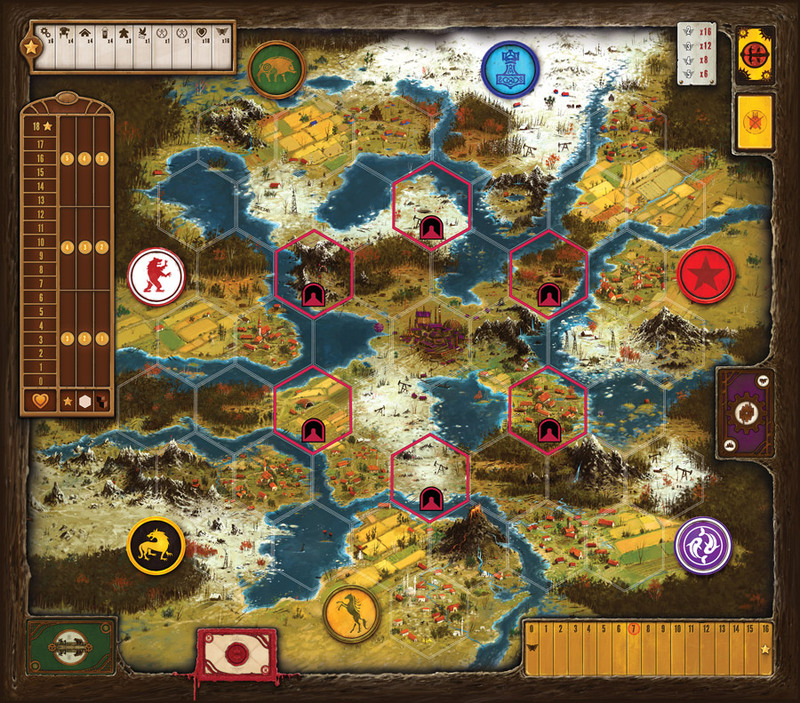 The last design challenge for the expansion factions was related to something that makes them unique in Scythe: They aren’t landlocked by a river. This is both good and bad for them: It’s good for them because they can move freely around the board to any open-land territory, including the Factory. But it’s also bad for them, because they don’t have the protection of a river. I knew from pretty early on that the expansion factions shouldn’t have the mech ability called Speed, which would allow them to move around a little too freely, especially given their lack of constraints on the board. At the same time, I wanted to give them a way to bounce back from a combat defeat, so I replaced Speed with abilities that allowed them to jump across the board to Flags or Traps (respectively). Last, I gave each of them new versions of the Riverwalk ability so the surrounding factions couldn’t get too comfortable. To add more variety to the player mat/faction mat combinations in Scythe, I wanted to add new player mats to the expansion. I had actually avoided several top-action/bottom-action pairings in the base game because they seemed too strong, but with the wealth of playtesting data I had from Scythe’s blind playtesting, I now knew how to balance them. Originally there were 3 player mats, but while blind playtesting the expansion, we found that players were really frustrated by one of them, so we got rid of it. 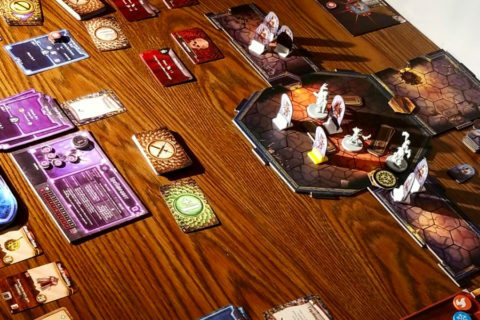 I always intended for Scythe to be a 5-player game at most, as I was concerned about the increased downtime, game length, and player interaction (which isn’t always welcome in what is largely a Euro game). However, I knew that some people would ignore my warnings not to play Scythe with 6-7 players, so instead of resisting, I decided to embrace the idea that some people would want to play Scythe that way, and I needed to make sure it worked. As it turned out, the main challenge for 6-7 player games is that they significantly decreased (or eliminated) the effectiveness of the Crimean Wayfare ability and the Polanian Meander ability. So we created new versions of those abilities and added tokens to the punchboard for use only in 6-7 player games. In those games, Wayfare lets a Crimean mech or character move to any unoccupied Farm, and Meander still allows for a Polanian character to choose 2 options on an Encounter card, but it also gives the Polanian player +$3 for each Encounter territory they control at the end of the game. As much as I love game design, I also really love seeing the final product come together. 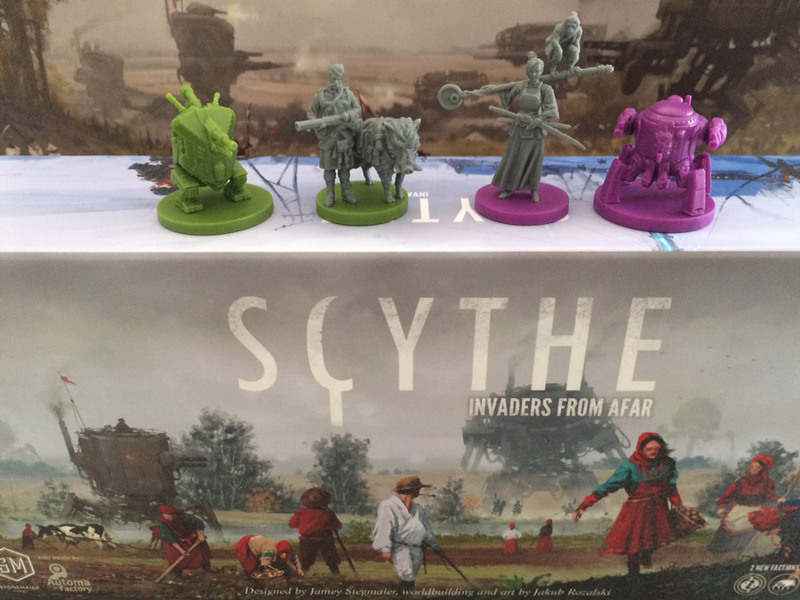 We sent the final files to Panda in June (though they had been working on the miniatures long before that), and at Gen Con in early August, a few members of Panda’s team stopped by to present me the Scythe: Invaders from Afar pre-production copy. I look forward to hearing about the adventures of Togawa and Albion when we release the expansion worldwide in November! Get Scythe , or Scythe: Invaders from Afar on Amazon. Previous Previous post: When the wind blows, Wendy goes wild! We really love your game, Jamey. Thank you for this high quality blog post about the Scythe universe! It’s is a shame that the plastic units are of a poor quality and difficult to apply primer to, compared to the rest of the game. Love the art. I cannot wait to experience the whole board full. I already have my copy of the expansion on pre-order at my FLGS. Nice preview and peek into the creative process. The artwork looks stunning, as expected. Thanks for including new Automa cards for us solo players. Will the flags and traps abilities work along with them? Scythe will be on top of my wishlist! The artwork is also amazing. Scythe is an amazing boardgame and has quickly become one of my all time favourites. 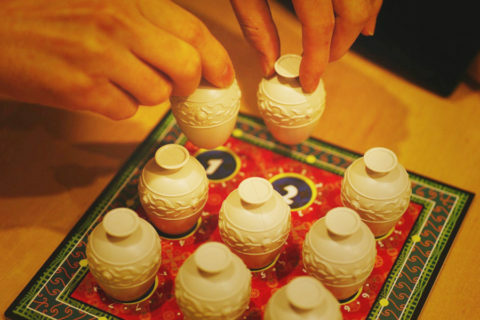 My play group and I play it at least once a week and my girlfriend has become obsessed with trying out different strategies and finding new ways to win the game. It is purely brilliant to play and to look at. Thank you for making Scythe!